Icy and I have lots of fun participating in the Paws2Read program at our local library. If you've read some of my previous My Dog The Therapist posts, you know that it's a reading program for children, where the kids read out loud to a Therapy Dog to help improve their reading skills. 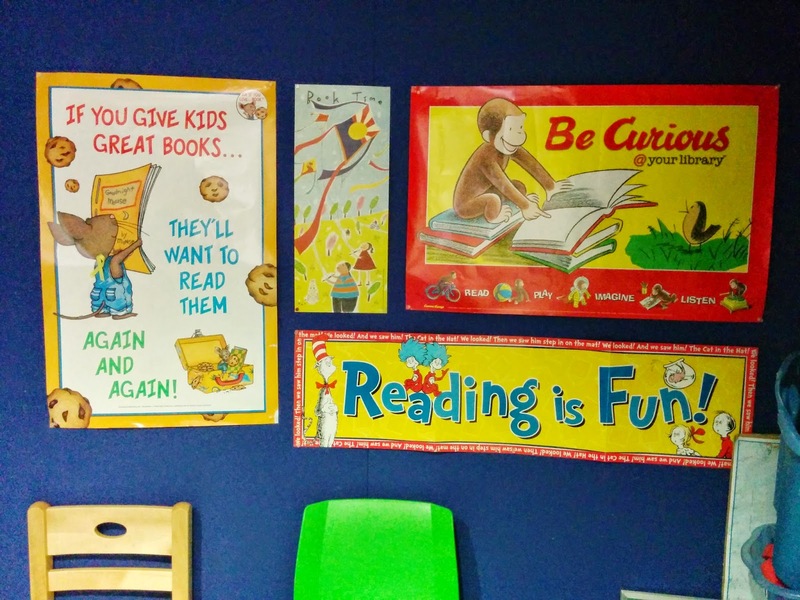 Posters hanging in the library reading room encourage kids to READ! The kids select a book of their choice, or bring their own book to read to Icy. When we head to the library, I always bring a couple of books myself just in case. Sometimes a child will select a book that is either too challenging for them to read or well below their reading level. If the book is too challenging, the child struggles a lot and reading the book becomes an unpleasant chore for them. If the book is too easy, the child gets through it really fast and it's boring for them. Rather than send the child back out to search for another book, I offer them one of mine. This saves time because each kid only gets 15 minutes to read to the dog. Icy in the library reading room with the book Getting Healthy with Harley. Recently, I added a wonderful book to my repertoire. It's called Getting Healthy with Harley, by Dorothy Wills-Raftery, and beautifully illustrated by Michelle Littler. I won the book in a contest sponsored by Dorothy on her blog, FIVESIBES. Yes, Dorothy actually has 5 gorgeous Siberian Huskies! One of her beautiful Huskies recently passed away, a very special dog named Gibson. The book is the second in a series of children's stories based on the lives of her Huskies; Gibson, Wolf, Chloe, Bandit, and of course, Harley! 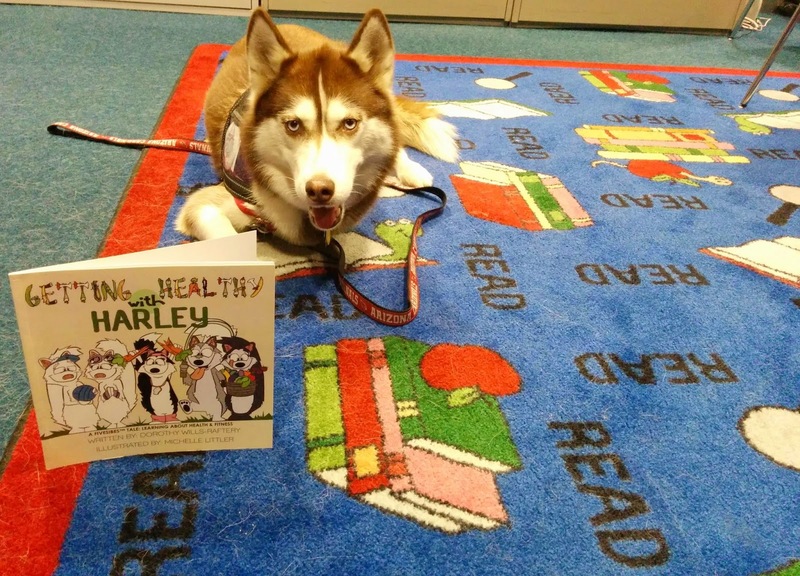 Getting Healthy With Harley is about Harley getting inspired by a visit to his veterinarian to motivate his Husky siblings to get fit and healthy too! The story is both educational and delightful! Several of the kids in our reading program got to read the story to Icy and really liked it. One such child was an 11 year old boy who came in with his 5 year old brother, who was not able to read, and their Mom. The older boy was a good reader and had gotten through his book quickly. He still had some time so I asked if they would like to read Getting Healthy with Harley. The younger boy asked his older brother to read the story to him. Both brothers sat closely on either side of Icy to read the story. The boys really liked the book, especially because it's about Huskies and Icy is a Husky herself! When they finished, I thanked them for reading the story to Icy and told them what a good job they had done. They high-fived each other. I then had Icy high-five both of them w/ her paw! They got such a kick out of that! The boys and their Mom all laughed and Mom took pictures of them with Icy! As we said our goodbyes I asked if they liked the story. They younger boy nodded vigorously and said YES he liked it a lot. Although it was below his reading level, the older brother said he thought it was a good book too and clearly enjoyed reading it to his little brother. Getting Healthy With Harley is available for purchase on the FIVE SIBES web site. Note: I did not receive any compensation, monetary or otherwise, for writing about this book. Does your public library have a Therapy Dog reading program? If not, have you asked about it? Leave us a comment, we always want to hear from you! THIS IS A MONDAY MISCHIEF PET BLOG HOP!! Oh that is just so wonderful!!! It's so rewarding and Isis has lots of fun w/ the kids! Thanks for stopping by Jenna! That is so wonderful to hear! Thank you so much for your post and it is so wonderful to hear children enjoying my book! You made my night! It's my pleasure, I'm so glad you like the post ( : It's such a nice book and I love the "Getting Healthy" concept - the kids that read the book really enjoyed it! Thanks for stopping by! PS - and many thank "woos" to beautiful Isis, too! Arooooo! Isis says, "you're very welcome"! We agree, what a wonderful and uplifting post!! Oh thank you, I'm so glad you enjoyed it! Thanks for stopping by today! It's great that you help children feel comfortable reading. 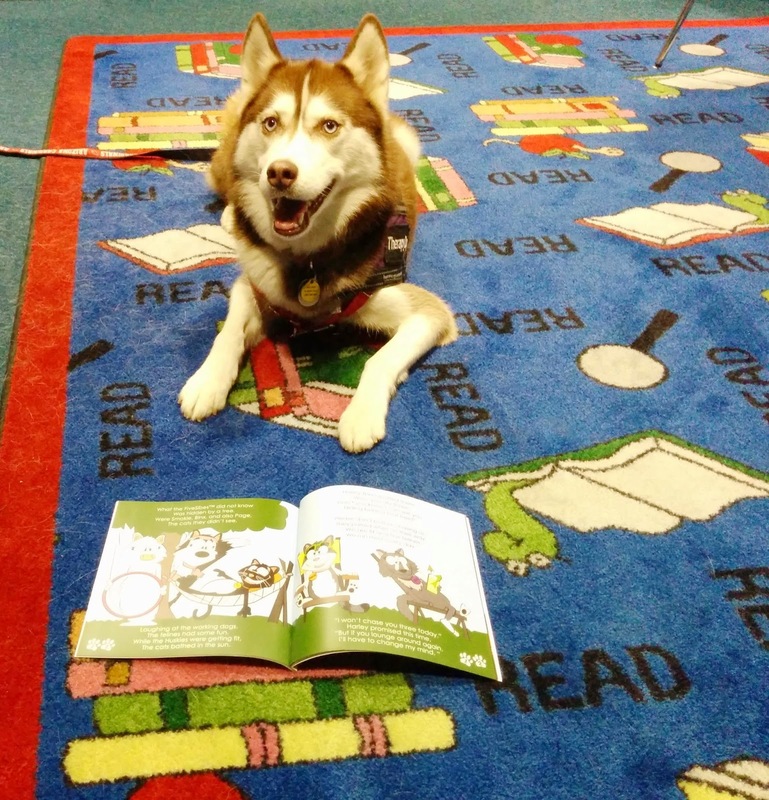 And how fun is it that they get to read a story about a Husky like you! We love it and it really is a lot of fun! The kids get a kick out of reading a story about a Husky to a Husky! Thanks for stopping by the blog today! Dogs are incredible! Reading programs and initiatives like these are just so beneficial. You made my monday! Yes, they are a terrific way for kids to improve reading skills in a safe, non judgmental environment. I'm so glad you enjoyed it! Thanks for visiting the blog! Oh wow, I loved the library as a kid. I spent so much time there (still do! ), I've always had a love of reading. I wish we had a program like that too. Does your Mom's library have a read program? If not, sounds like an opportunity to start one! Thanks for stopping by! Harley is a Tail Wagging Tutor - it's a great program, and he and I both enjoy being around the children. That's great! Something else we have in common besides pet blogging (-: It really is a great program, the kids love it & so do we. Thanks for visiting the blog! The program is a lot of fun and does to much good for the kids. I love this book -not only is it about Huskies, but it encourages fitness. You should definitely take the CGC! We visit nursing homes as well. The Seniors love the visits, it means a lot to them. I hope you go for it! Let me know if you do. Thanks for stopping by today Flea!